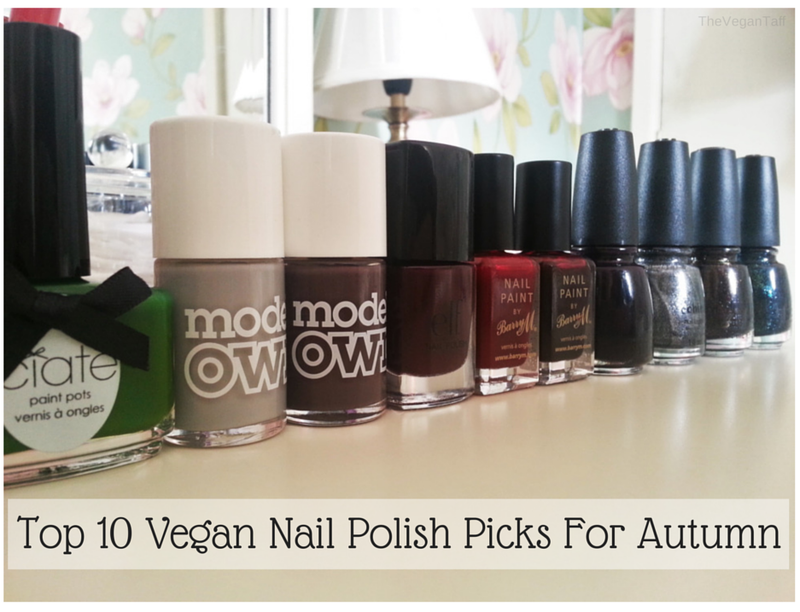 What use would an autumn nail list be without a deep green? This shade reminds me of the colour of the leaves on the tree in my back garden, right before they change to orange. It's a gorgeous creme that is opaque in 2 coats. I've been on the hunt for the perfect grey polish for months now, and could never seem to find the exact shade I had in my head, I even tried mixing my own. Misty Grey is the ideal name for this shade, it's not just a grey creme, it has a smokiness to it that makes it look very elegant and chic. The swatch below shows 2 coats. As well as the perfect grey, I've also been on the hunt for the perfect purple/grey hybrid. While this isn't what I had pictured in my head, it is beautiful in its own way. It's a very deep smoky purple with an obvious grey tinge. I wore this polish at the end of last week, and it lasted a full 5 days on me without chipping or tip wear. That's almost unheard of! This creme polish is fully opaque in 2 coats also. From a distance you could be forgiven for thinking that this polish is black, but if you look closely you can see the plum in it. I love the formula of this creme, it's opaque in 2 coats and is pretty quick to dry. ELF nail polishes are so budget friendly (this has been reduced to £1 for months now), but they look, and apply, like a much more expensive brand. Every nail polish collection needs a good red, and this is the best of the bunch for autumn, in my opinion. I seem to have a favourite red from Barry M for every season. Red Wine is a beautiful deep red bordering on burgundy, and just like every other Nail Paint, the formula is a pleasure to work with. The swatch shows 2 coats, and that's really all you need for this to look gorgeous. Like almost every other nail polish addict out there, I have fallen in love with Chanel's Rouge Noir, but since it's not vegan I've had to find an alternative. I really would call Red Black a good dupe for Rouge Noir, even the name is the same, albeit in a different language. Even if you don't require your nail polish to be vegan, why spend so much money on a polish if you can find a dupe for £2.99? If Barry M's Red Black is too red for you, Crimson by China Glaze is the polish for you. It's a very, very deep red, so much so that it looks black in normal light. I love black nail polish but this a nice change to it whilst still being similar enough that you don't miss it too much. Stone Cold is the only matte polish that made it onto this list. As much as I love a good creme formula (as you can clearly see in my 7 out of 10 polishes here) I just couldn't leave this off. This polish is from China Glaze's 2012 Hunger Games collection, and represents District 2 - masonry. Even though the collection is two and a half years old, I still love it and have another polish from it coming up. This polish reminds me of black denim, I think it'd be perfect for some denim nail art. I only picked up Midtown Magic because I was early for the cinema one day so went browsing my local Sally's. They had a bunch of China Glaze on sale for £1.07 each, so obviously I picked up a few. I'm actually surprised that I love this so much, with the polish leaning towards brown with bronze micro shimmer, it's one that I'd normally stay away from. It's always nice to have alternatives to your favourites, and this is very similar to my all time favourite polish, Smoke and Ashes, coming up next. The first coat looks very much purple, but with 2 coats it's fully opaque and the purple has all but disappeared. I've saved the best for last. If you read my rave on this polish a few weeks ago, you'll know how much I love it. It's opaque in 1 coat, dries fast, has a great shine and looks so beautiful in different lights, sometimes it looks black, other times it looks green. It has gorgeous green micro shimmer running through it and is very similar to Midtown Magic. I really can't say anything I haven't already, so if you want to see my photos and thoughts on it more, you can by clicking here. Smoke and Ashes is also from the Hunger Games collection and represents District 12 - mining. What do you think of my nail picks for autumn? What shades do you reach for when the weather turns?